Five years ago Lorena Brady had a dream. While attending a cheerleading competition in Toronto she had the pleasure of seeing a team of special needs athletes compete. She returned home determined to start a special needs team in Thunder Bay. And so the Dreamers were born. They found a home with the local DCA (Dynamite Cheer All Stars) gym and what started out as a team of 9 grew to a team of 20+. The Dreamers practice weekly and compete and perform in at least three shows each year. The hard work, joy, and enthusiasm that the athletes perform with are always a show-stopper, often yielding standing ovations. Recently Lorena and her fellow head coaches received the FREE FROM LIMITS award from the Brandon Lack Studio Organization. Brandon Lack is a successful artist from Austin, Texas who happens to have Down syndrome. FREE FROM LIMITS recognizes individuals who demonstrate genuine respect for any marginalized group in a meaningful and beneficial way. 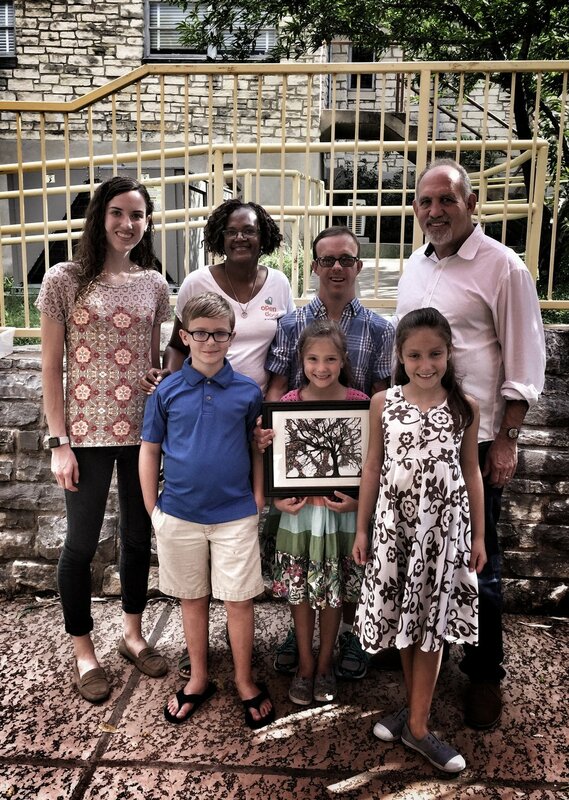 Recipients of the award receive a framed print of one of Brandon’s paintings – an illustrated reminder that none of us should have limitations imposed on their potential. The love, dedication and respect shown by these coaches for the Dreamer athletes makes them a shining example of what the FREE FROM LIMITS award is all about. 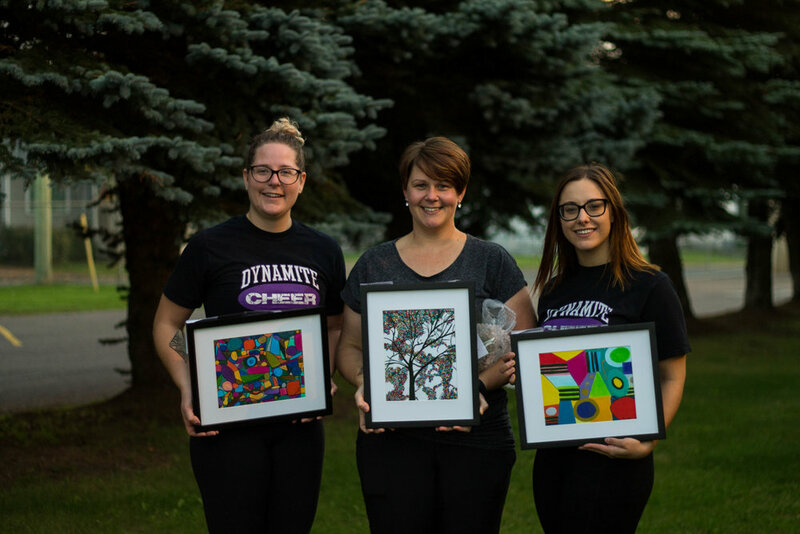 Through their efforts they have created an opportunity for special needs cheerleaders that previously did not exist in Thunder Bay, providing them with the opportunity to grow and shine in ways they could previously could only imagine. Congratulations Lorena Brady, Chelsea Nagy, and Nicole DesRosiers for being selected for this award, and for all you do for the Dreamers! Our friends at Austin's famous Hatbox downtown is showcasing Brandon's art again! Come join us for classic hats, music and reception, along with many of Brandon's new pieces. "Authenticity with a modern twist, Les Givral delivers Fresh, Fast, Healthy, Affordable Vietnamese cuisine." Join Brandon and his sisters for an EVENING ART SHOW at Austin's famous Hatbox on December 28th at 704 Congress Avenue. Many original pieces, as well as framed prints, will be on display and available for purchase. Say hello to Brandon and enjoy hot cider and cookies. Brandon's art has been selected to be included in the 8th Annual Holiday Show November 14 through December 23, 2016. His selected artwork, prints and notecards, will be available to be purchased at the show. The exhibit will be on display at the AGE of Central Texas Building at 3710 Cedar Street, suite 101, in central Austin. May 9 through June 6 Brandon's art will be featured at the iconic Magnolia Cafe on Lake Austin Blvd. Stop by and check out his exhibition and enjoy some gingerbread pancakes! Kelle Hampton featured a few artists with special needs on her popular blog ENJOYING THE SMALL THINGS and Brandon was included. She included a photograph of one of Brandon's abstract paintings hanging above a couch. You can find Kelle's blog at kellehamptonblog@comcast.net and @ETST on Instagram. EAST is a free, annual, self-guided art event occurring over two weekends in November, providing the public with an opportunity to meet the makers: the local artists and artisans who leave a lasting imprint on Austin's vibrant, dynamic culture. Tour-goers are invited to discover new artistic talent, see working studios, learn about artists' tools, techniques, and inspirations, and explore unique spaces and local businesses. DUE EAST is the official kick-off event, catalog premiere and fundraiser for the East Austin Studio Tour! Be the first to view the EAST group exhibition, with select works from over 300 artists on the tour, and enjoy complimentary beverages and food from Tito's Handmade Vodka, Austin Beerworks, Juiceland, Austin Eastciders, Chameleon Cold-Brew, Wunder-Pilz Kombucha, La Condesa, Sway, Jacoby’s Restaurant and Mercantile, St. Philip and Lick Ice Creams. DUE EAST will also host a variety of special performances throughout the evening, plus a silent auction with one-of-a-kind experiences from local Austin businesses. Gallery Exhibit and being honored! Throwback to the ‘40’s to celebrate Open Door’s 40th Anniversary! The Visionary Volunteer Award recognizes individuals whose volunteerism has made a deep and lasting impact on Open Door’s programs and services.